An awesome split at a great price. 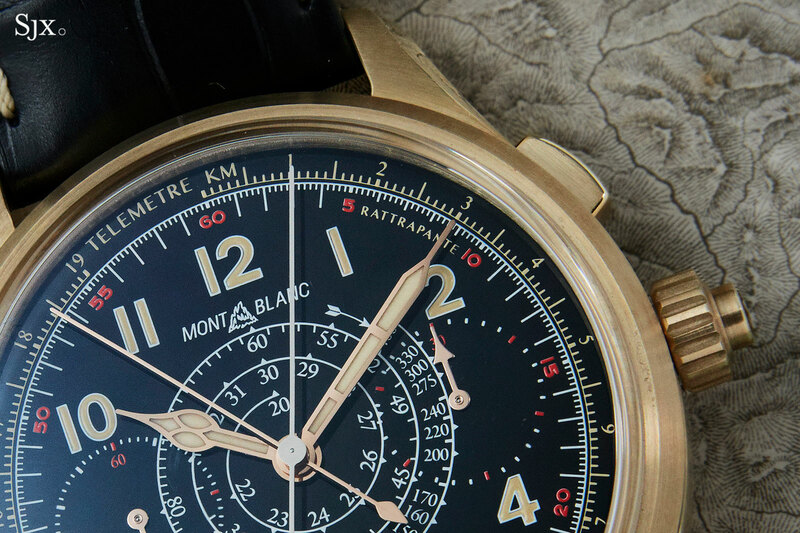 The complicated watch that offered the most bang for the buck at SIHH 2019 was probably the Montblanc 1858 Split Second Chronograph in bronze. A big watch, maybe slightly too big, the 1858 split-seconds boasts a traditionally constructed and decorated rattrapante movement, albeit one that was designed for a pocket watch, for just over US$30,000. It’s also a single-button, or mono-pusher, split-seconds, with start, stop and reset functions for the chronograph controlled by the button co-axial with the crown, while the split button is at two o’clock. As such things go it’s almost a bargain. The new 1858 is the only split-seconds unveiled by Montblanc in recent years, and is powered by the MB M16.31, a hand-wound movement that’s essentially the MB M16.29 found in earlier 1858 chronographs with the addition of a traditional split-seconds mechanism on top. That means the addition of a second column wheel for the split-seconds mechanism, which sits high in the centre of the movement, with the distinctive pincer-shaped split-second wheel brake on either side. 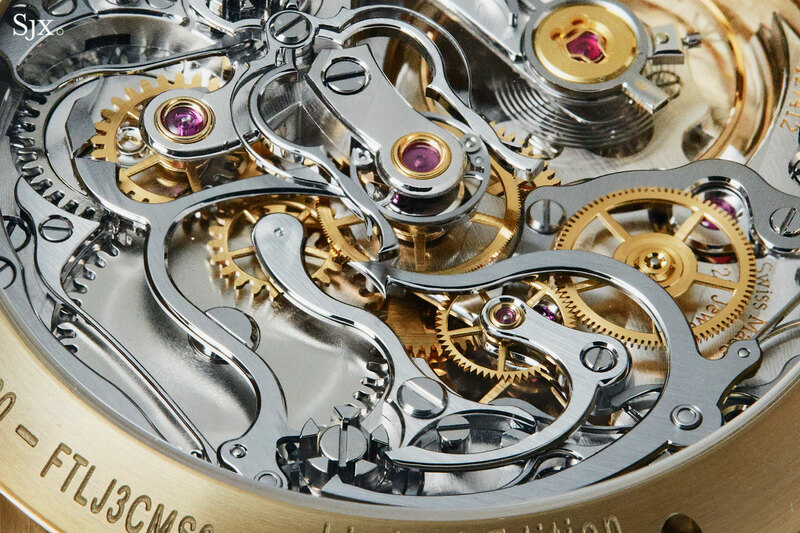 As is typical of the Minerva movements found in Montblanc watches, the MB M16.31 is wonderfully decorated. All of the chronograph levers are strikingly finished with brushed top surfaces and prominent, polished bevels. Even the teeth of the winding and barrel ratchet wheels are mirror polished. 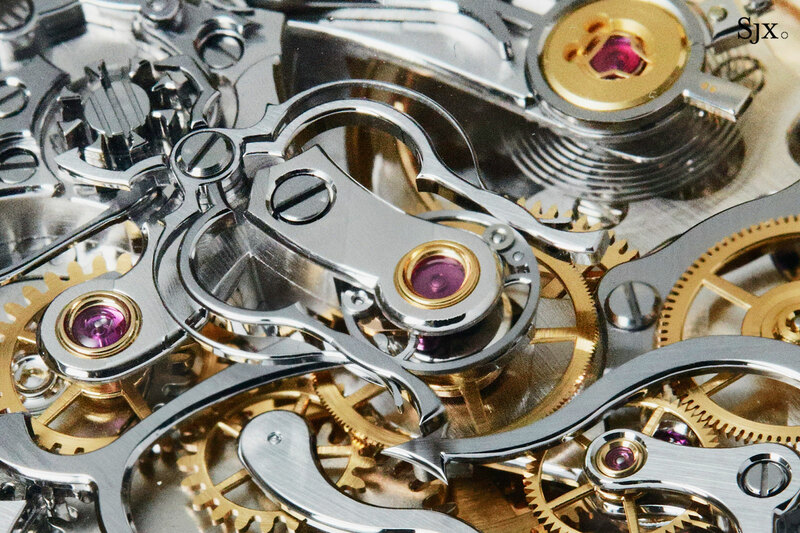 Though Montblanc says the finishing on Minerva now is exactly the same as it was when they were in watches that retailed for three to four times as much, it is hard to escape the feeling that some minor finishing details were simplified, like the bridge for the pallet fork below the balance wheel. A side by side comparison with a first generation Montblanc-Minerva movement isn’t available, but it does feel that way. 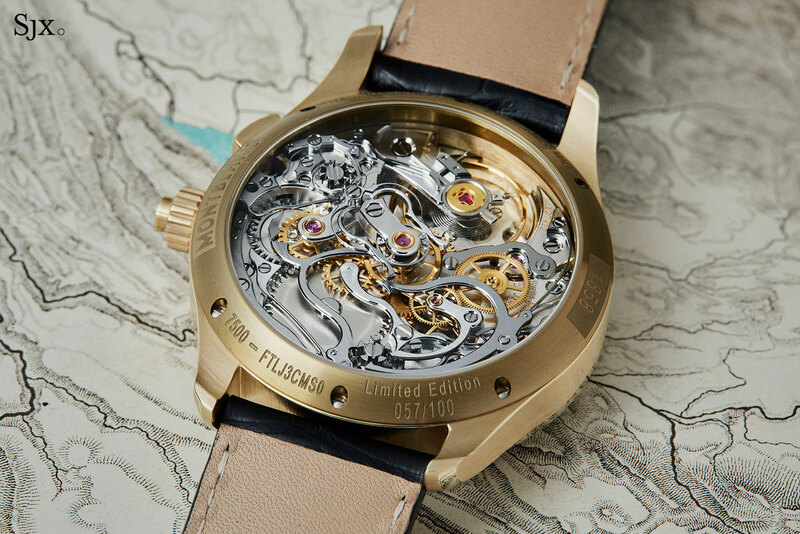 Be that as it may, the movement is still an incredible sight to behold, especially for just US$30,000. As is now standard for the 1858 line, the dial is heavily retro and modelled on Minerva wristwatch chronographs of the 1930s. The colour palette employed works well for this particular style of dial. It features a double chronograph scale, telemetric and tachymetric, along with beige Super-Luminova on the dial and hands. As is often the case with faux-vintage lume, it does feel like the watch is trying a bit too hard to look old when it really doesn’t need to. 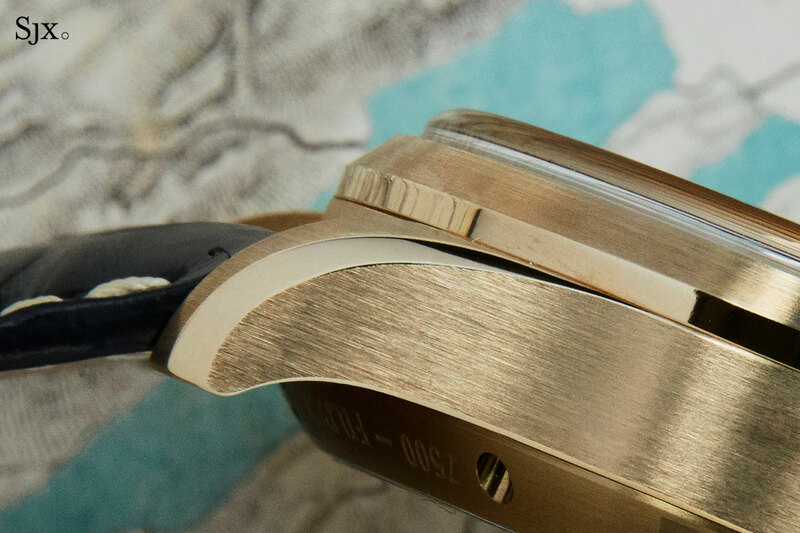 The watch case is bronze, specifically an aluminium-heavy bronze alloy that will develop a brown patina over time, as opposed to the green oxidisation that forms on most bronze. 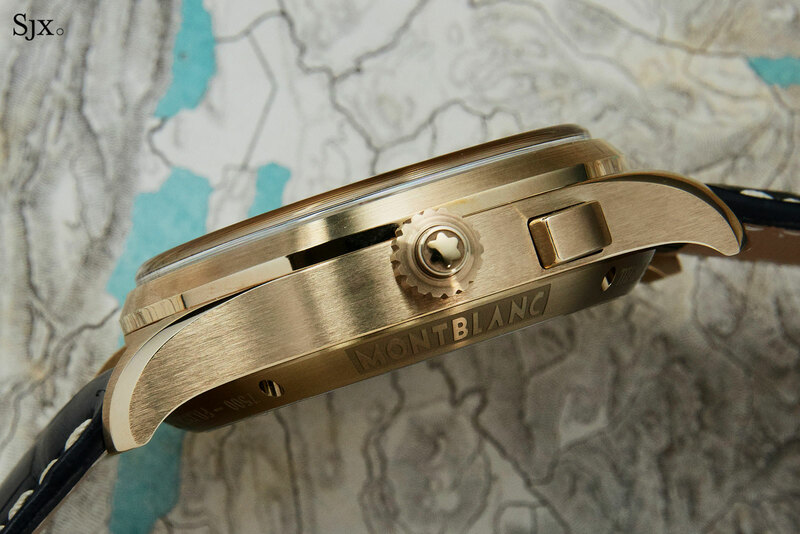 While the case metal works with the retro look, bronze feels a bit too fashionable now, particularly since it was used so liberally by Montblanc this year. Nevertheless the bronze case is well finished, just as a steel or a gold case would be, with contrasting polished and brushed surfaces. The only real downside of the watch is its size. The case is 44mm and 14.5mm high, with a high bezel and domed sapphire crystal that accentuate its thickness. It really does look and feel as big as it sounds. That’s a consequence of the movement, which is derived from the Minerva cal. 17-29 pocket watch movement designed in 1929. But the size no doubt contributes to its relatively affordability. A smaller and thinner split-seconds movement will be exponentially more expensive due to the increased fineness of the parts, meaning increased complexity in manufacturing and effort for finishing and assembly. All in all the 1858 split-seconds is a great product that does what it is supposed to do well, even if the bronze case feels overly trendy. 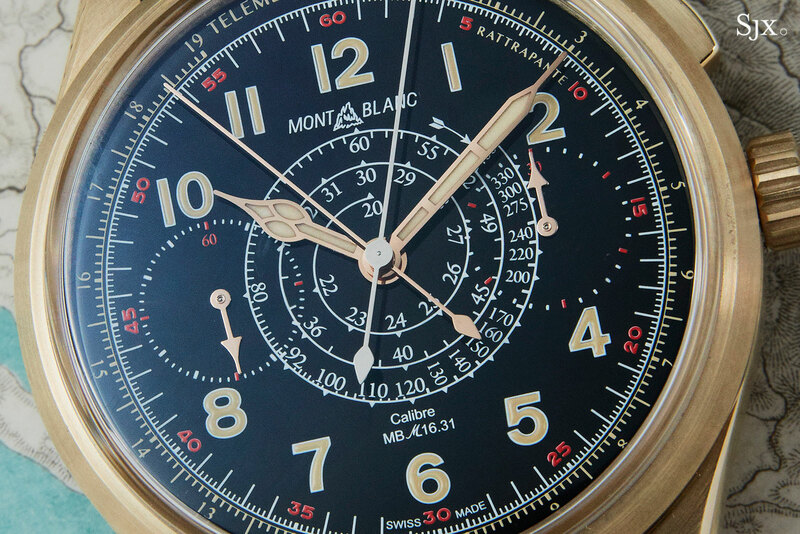 In fact it is arguably a true connoisseur’s watch, since Montblanc isn’t a significant presence for watches at this price point, which means most buyers should be shelling out for this watch almost solely for the movement. And naturally the same movement in another, more conventional case metal – I would love to see it in titanium – will be a winner. 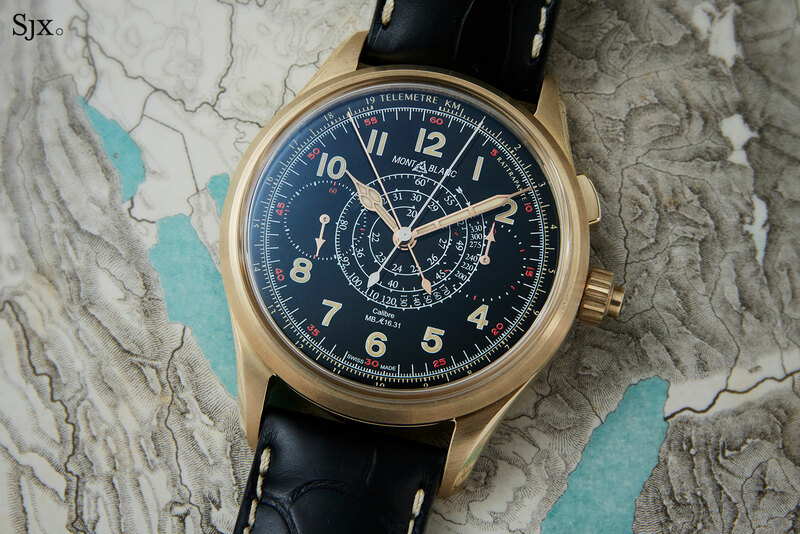 The 1858 Split Second Chronograph in bronze (ref. 119910) is limited to 100 watches, priced at €32,500 including 19% tax. It’ll be available starting the second quarter of 2019. Smaller, better proportioned, and also less expensive. An oversized vintage-inspired chronograph dressed for modern tastes. Retro styling and a movement courtesy of IWC.